Artwork of Kuff 'n' Klout from Donkey Kong Country 3: Dixie Kong's Double Trouble! 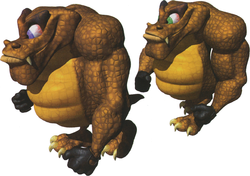 Kuff 'n' Klout (also known as the Kremling Twins) are two large, beefy, and light brown Kremlings in Donkey Kong Country 3: Dixie Kong's Double Trouble!. They are the most powerful Kremling enemy in the game, even more than Krumple. They only appear in a few Krematoa levels: Stampede Sprint, Criss Kross Cliffs, and Tyrant Twin Tussle. They attack by making movements reminiscent to a game of leapfrog, or racing about the screen, shoulder to shoulder. Some Kuff 'n' Klouts perform the former then the latter in succession to each other. Kuff 'n' Klout can only be defeated by barrels, or by using Squitter's webs, since they are immune to Team-up throws, and Dixie and Kiddy will get injured if they attempt to attack the twins directly. If one of the Kremling Twins is defeated, the other continues to charge, and it disappears when the Kongs move offscreen. In the Game Boy Advance port, Kuff or Klout is motionless and suddenly disappears after a few seconds. Kuff 'n' Klout's only distinguishable attribute is their eye color, as shown from their artwork. One of them has purple eyes while the other has green eyes. However, both of them have green eyes in the game, therefore making them indistinguishable. According to Dixie's Photo Album, Kuff 'n' Klout are categorized under the "Kremling Kreeps" enemy class. Kuff 'n' Klout are one of the few enemies to not reappear in Donkey Kong Land III. ↑ The Donkey Kong Country 3: Dixie Kong's Double Trouble Player's Guide, page 112. This page was last edited on April 13, 2019, at 11:07.